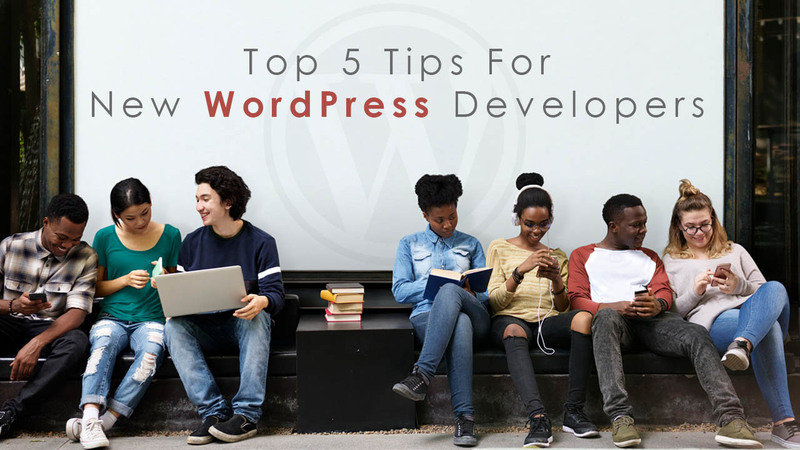 Before sharing top 5 tips for new WordPress developers, let me give you a quick introduction about WordPress. WordPress is one of the most powerful yet the simplest content management systems for websites and blogs. It has doubtlessly provided limitless opportunities to WordPress developers and possibilities to companies owning website based on the CMS. Today, businesses from diverse industries are adopting the technology for a variety of websites, including e-commerce platforms. WordPress is a high quality system for websites and is unquestionably going to stay here for a long time. If you are new to WordPress, this post is just for you as a warm-up exercise. New designers can easily adopt WordPress and turn out to be an expert in customizing it. Experienced WordPress developers know how convenient it is to complete the requirement of clients by using this content management system. If they need a unique feature for their website, WordPress allows full customization and offers thousands of free/paid plugins. These plugins can be used to add desired features and functionality to a website. WordPress isn’t merely another PHP technology so that any regular PHP developer will handle it. There are needs of years of experience and the deep understanding of the CMS because it’s now a full-fledged technology running at the back of millions of websites of businesses from across the world. Are you new to this CMS? If yes, this post is just for you as already mentioned above. Allow me to share some best of tips helping you as a new WordPress developer. To design WordPress as per the demand of a project, it’s compulsory you own thorough experience in PHP. You should learn how to handle different templates as each one will present unique challenges. You should also learn how to customize a theme as, often time, plug-ins aren’t available to fulfill a particular requirement. Apart from PHP and the understanding of themes, you must be familiar with HTML and CSS to handle various design elements for customization. Once you have decided to become a WordPress designer, the next thing to learn is the structure of WordPress that how the platform really functions. Luckily, you will effortlessly be able to locate a lot of information to learn about WordPress in general. Codeinwp.com shares a wonderful post “What Most Web Designers Have Wrong About WordPress Theme Hierarchy” to learn the hierarchy of WordPress. I don’t say this post will turn you an expert, but it will contribute a lot as a starting point. If you want more details on WordPress CSS, you can check this reference. You will need to learn the WordPress Specific CSS to handle a variety of attributes in the CMS. If you have already been doing the web development, it will not be difficult for you to reuse the knowledge. If you have already used CSS in static websites, the same approach will apply to WordPress too. Apart from this, you will need to learn the WordPress-specific CSS. You can also read the blog “Default WordPress Generated CSS Cheat Sheet for Beginners” published on Wpbeginner.com. It will help you better understand the CSS classes and IDs. But there is no definitive guide over this because you come across a lot of theme-specific CSSs that you will discover on your own. If you are still not able to handle CSS, you can try a drag and drop framework like Visual Composer Website Builder that doesn’t require you to write CSS manually. The framework offers ready-made elements that you will have to drag from a panel and drop on a page. That’s all. But it’s still recommended to learn handling CSS manually to come on as a WordPress developer. Being a WordPress designer, you should have the habit of examining internals of existing themes. To become experts in this, first learn about some good themes and yes do not learn this from bed designers. The best source to do this online is the official WordPress theme Directory. Here is the link to reach there. Here you can download some good themes, install and test them, and if you like a particular one, you can dissect that to enhance your knowledge about WordPress themes. Last but not least – try to read a lot about WordPress. The platform keeps changing rapidly and, if you want to stay on the top, you will need to learn about all these changes so that you can fulfill the requirement of clients. New WordPress versions are pushed quite frequently. New versions of plugins are also published in the same fashion. You need to keep an eye on all online platforms providing information and news related to WordPress. Two best sources to read about the CMS are WordPress.org and WordPress.com. Sofia Coppol is the technical writer of Rapidsoft Technologies, a prominent mobile app development company which provides Android app development and iPhone app development services across the global. She loves to write on business startups, enterprises, latest mobile trends and technologies.